A world premiere adaptation of the best-selling book series, with an astronomical cyber threat adventure! Portland, OR – Villains are threatening New Mouse City, and the only hope is our reluctant hero, Geronimo Stilton! In this “enormouse” adventure, Geronimo is launched into space on a top-secret mission to save the day! Based on the wildly popular book series featuring Geronimo and his pals, Thea, Trap, and Benjamin, this story will “rocket” your family to another world. 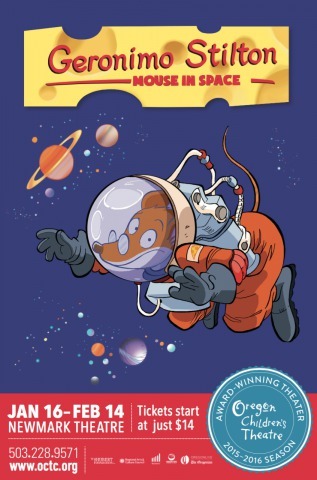 Geronimo Stilton: Mouse in Space is based on the bestselling Italian book series by Elisabetta Dami and adapted by John Maclay. Since its original publication date in Milan in 2000, Geronimo Stilton books have sold over 115 million copies worldwide and have been translated into 45 different languages, by Italian based Atlantyca Entertainment, a multi-faceted entertainment company and the IP owners of the Geronimo Stilton brand. Audience members are invited to come early to performances and participate in fun pre-show craft activities by Art a la Carte. They are also welcome to stay after the show to meet the cast and get their playbills autographed! Before Every Performance: Come up to an hour early for craft activities by Art a la Carte! Following Every Performance: Meet the cast, take photos, and get your playbill autographed! Saturday, January 23, all shows: Girl Scout Day. Tickets for Girl Scouts are discounted to $11-$21. Fun patches are available for sale for $2 each (order in advance!). Saturday, January 16, all shows: First Timer/First Saturday. $5 tickets for children attending theater for the first time. See www.octc.org for details. Sundays, January 17 and February 14: Grandparent Day. Saturday, January 23, 2:00 pm: Interpreted performance in American Sign Language. Founded in 1988, Oregon Children’s Theatre has served well over two million children, teachers, and families. OCT is Oregon’s largest non-profit professional children’s theater company and a resident company of Portland’5 Centers for the Arts. OCT serves more than 120,000 children of all ages each year. OCT offers numerous school services including study guides, teacher professional development, in-school workshops, and an extensive outreach program. In partnership with Kaiser Permanente, the Educational Theatre Program provides free touring productions that promote healthy living. OCT’s year round Acting Academy offers theater classes for children ages 3-18 and Young Professionals, a mentoring program for teens. Funding for the 2015-2016 season is provided in part by the Regional Arts & Culture Council and Work for Art, Oregon Arts Commission, the Shubert Foundation, and the Oregonian. 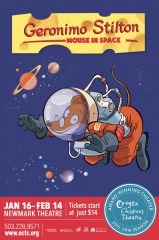 Geronimo Stilton: Mouse in Space is a Ticket to Read title. Ticket to Read is a new program linking literacy to live theater by providing students from low-income schools with a free theater ticket and a companion book to take home and keep. This program is supported in part by The Portland Timbers, KPMG, and the Community Foundation of SW Washington. www.octc.org/supportoct/tickettoread.